Chimneys are designed and built in order to withstand wind, rain, heat, and cold. However, the interior of the chimney and fireplace are made up of a number of delicate components that cannot be exposed to the elements. A well-fitting, well-installed chimney cap is the first line of defense in protecting your chimney against the weather. 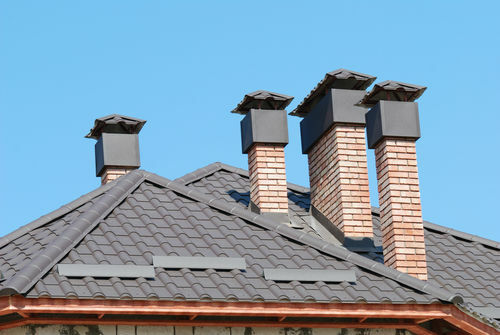 A chimney cap is a fitted hood made out of metal such as stainless steel, aluminum, or copper. Chimney caps are designed to cover and protect the top of the flue while still allowing the byproducts of combustion from the fireplace to vent safely. This is done by incorporating a solid metal top with open mesh or wire sides. This allows smoke, gas, and hot air out, draws fresh air to be drawn in to feed the fire, and prevents outside elements such as moisture, debris, or even animals from entering the chimney. A well-maintained chimney cap in good condition is one of the best ways to protect the health of your chimney system. Below are just three of the ways that chimney caps protect your chimney system. Animal entry: Chimneys are tempting nesting or hiding places for many small animals including birds, squirrels, and raccoons; chimney swifts, in particular, are known for seeking out chimneys to nest in. Animal entry can create a number of issues for your chimney system, including damage to the liner, the creation of blockages from nesting material, or even the deaths of the animals themselves if they become trapped. Debris: When the top of the flue is open, anything blowing past the chimney can fall into the chimney. This can include leaves and branches, plastic bags, or even frisbees or balls. The presence of these items in the flue increases the risk of a chimney fire and can prevent proper venting. Moisture: Water is one of the most damaging forces to a fireplace system; while bricks and mortar are built to withstand exposure to water, interior fireplace components can be damaged by even small amounts of moisture. Without a chimney cap, water from rain, ice, snow, morning dew, and even sprinklers and hoses can enter the chimney can cause damage throughout the fireplace system. Does my chimney cap need to be replaced? Chimney caps can be damaged from overexposure to the elements, improper installation, being poorly constructed, and more. If a chimney cap becomes damaged – especially if it is older – the best option may be to have it replaced. Replacing a chimney cap should only be done by a certified chimney professional. Because a gap of as little as an inch can allow birds to slip into the chimney, it is important that the chimney cap is perfectly fitted to your chimney. Likewise, a chimney professional can discuss with you the pros and cons of various types and styles of new chimney caps; custom designed chimney caps can be used as a way to improve your home’s curb appeal and add a unique decorative touch while still functioning to protect the chimney. A new chimney cap can help protect your chimney against the elements and extend the life of your fireplace system. For more information about installing a new chimney cap in your home, contact Chimney TEK today.